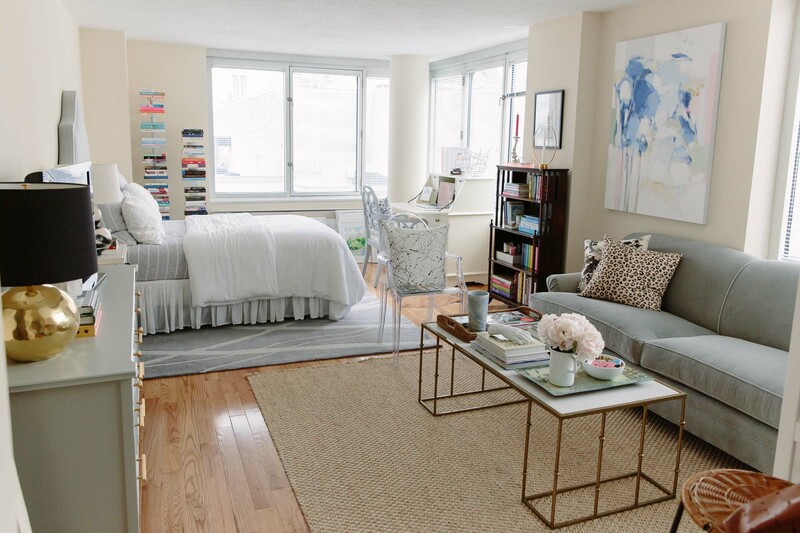 More often than not, it seems that living in NYC means living in a studio apartment. I’ve lived in a studio for eight out of the almost nine years I’ve lived here, and I’ve always found them to be fun to decorate! If you want to look at it positively, the openness of a studio really aligns well with the whole trend of open-plan living that you see all over HGTV and whatnot. That being said, most of us would probably prefer to live somewhere where the bed isn’t in the living room, but alas, that’s city life! Decorative screens, especially ones that are sheer, are a perfect example of the divider-but-not that I was explaining above. 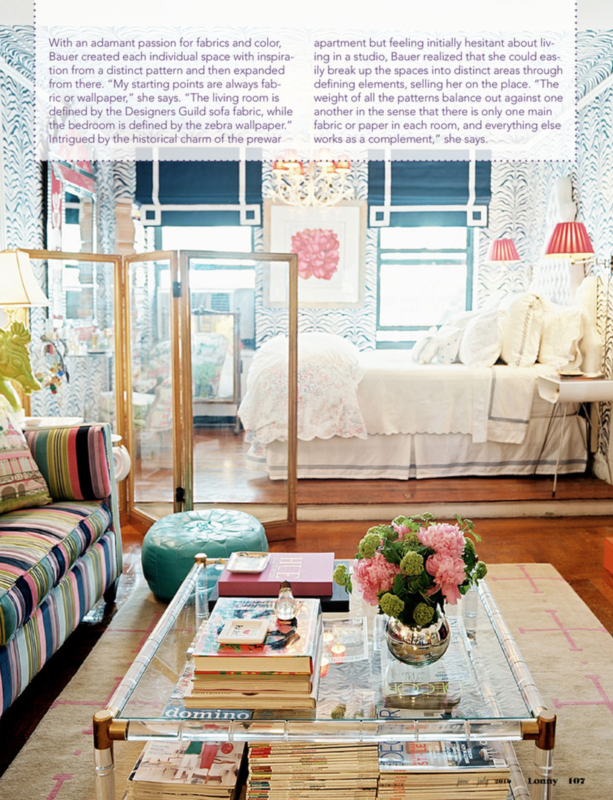 This spread is from a 2011 issue of The Home Observer and I kind of can’t believe I haven’t seen it until now! 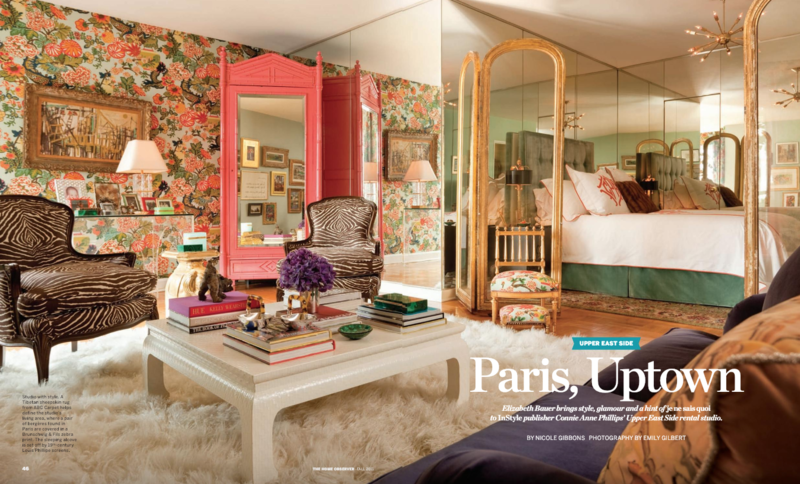 Elizabeth Bauer decorated this Upper East Side studio beautifully – I’m obsessed with all of the detailing and patterns, but what’s most pertinent for this post is the pretty decorative screen she used to subtly convey the division between living space and bedroom. And it’s not what this post is about but I have to mention the brilliance of the way the mirrors are used to create the illusion of more space. In fact, you can see that the bedroom area is mirrored while the living space is wallpapered – another smart way of creating a sense of division, as I’ll get to below! Here’s another view of the gorgeous screen from the opposite side. 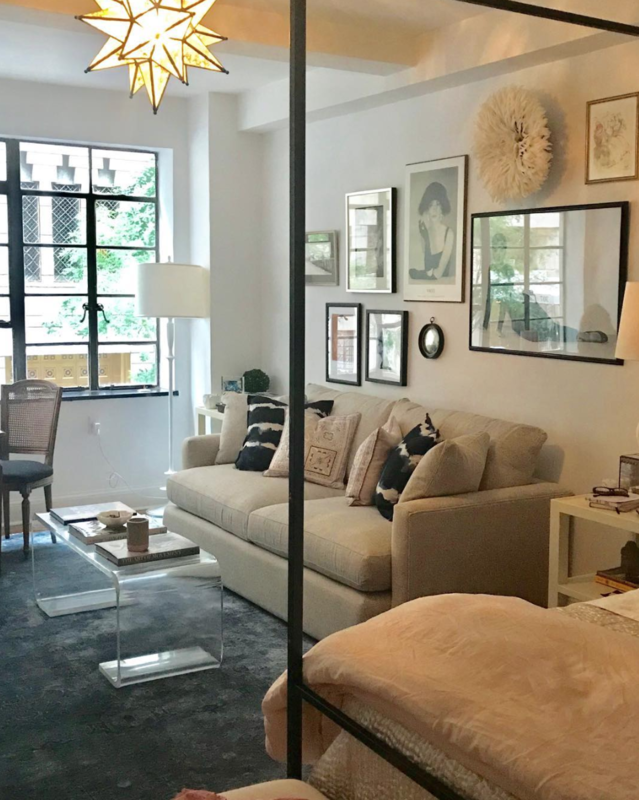 That brings me to another Elizabeth Bauer apartment I’ve been obsessed with forever – her own Upper East Side studio featured in Lonny back in 2011. 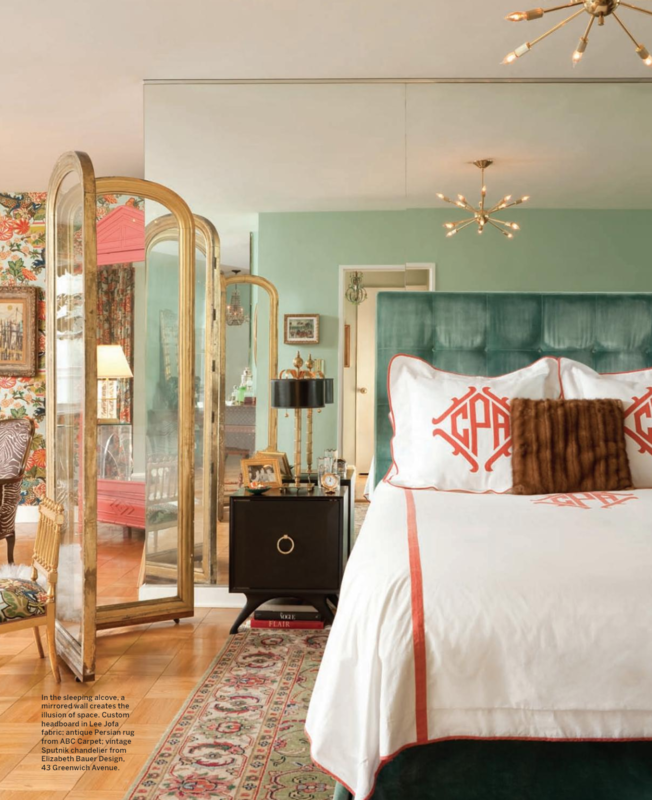 You can see that she utilized the same two strategies to create a sense of division – the see-through decorative screen as a divider, and the wallpaper. Here she wallpapered the ceiling as well, creating an extra cozy, enveloping feeling. 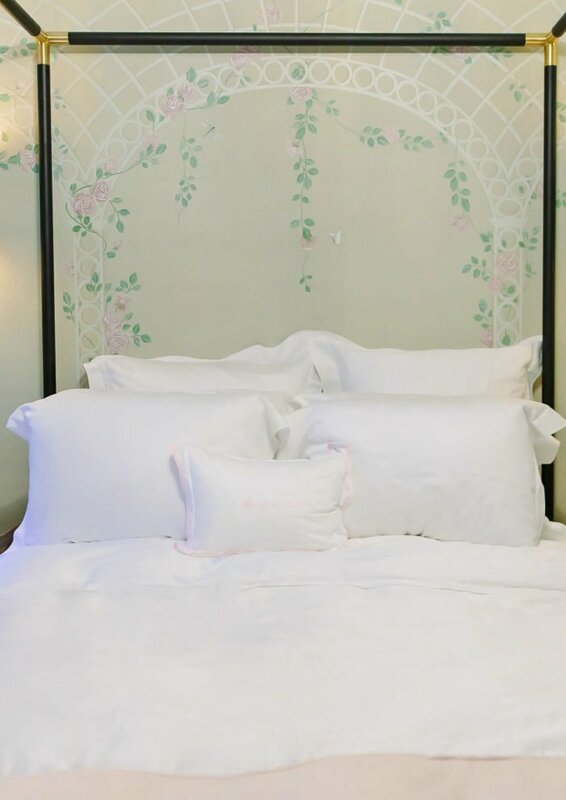 One caveat – I’m not sure that this would work for every space, because you really need a natural stop to the wallpaper – you can’t just have it randomly stop in the middle of the wall. As you can see if you look really closely, in Elizabeth’s space there are some sort of architectural moldings that create a natural place for the wallpaper to stop and the paint of the living space to begin. If you’re really motivated/crafty, you could apply those moldings yourself and create this same effect – and if you’re a renter you could use peel and stick wallpaper! While generally I’m against faux walls in a studio, this is pretty genius – designer Elaine Burns used “plantation shutters” to create a faux entry space that blocks her bed from viewers when they first enter the space, while still allowing light and air to pass through. 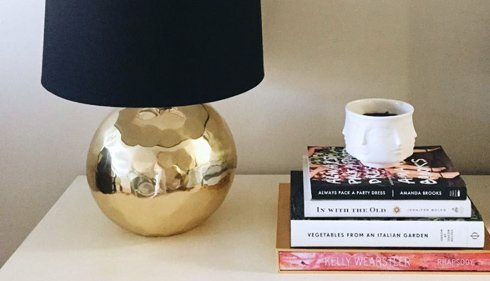 This might require some work and ingenuity, as Elaine had them custom made – but it could totally be worth it (especially in an apartment you own, rather than rent). You can see the full tour of her studio here. The main thing to remember is that it works because the shutters are open and airy, not solid. My love of the Ikea Expedit (now Kallax) as a studio apartment divider is well-documented in this space. It’s like a see-through wall – it divides the space while still letting light and air through, so it doesn’t cut things off or make the space feel smaller than it is. 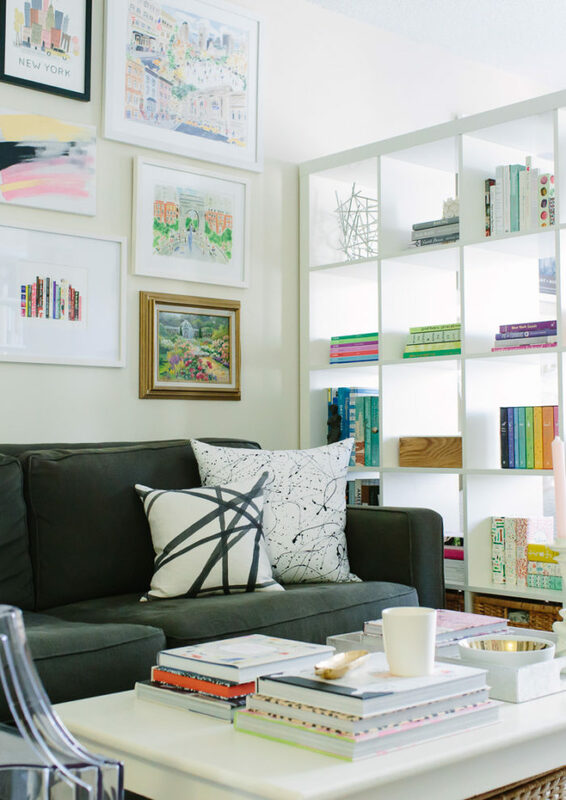 It’s also the best for extra storage and super fun to style and decorate…I seriously kind of miss mine! These photos are from my first studio apartment. This is a strategy I came upon by accident! When my movers were unloading my stuff into my new apartment, my main man Julio (he was my mover and helps me with everything, he’s the best) laid out the bedroom rug and for some strange reason I was like, nah I don’t want that rug anymore. He seemed skeptical, asking if I was sure I wanted to get rid of it? I was all yeah totally! Throw it out! He basically convinced me to keep it for the time being at least and what do you know – it turned out to be a perfect way of creating a visual distinction between the living area and the bedroom area. Thank you, Julio! 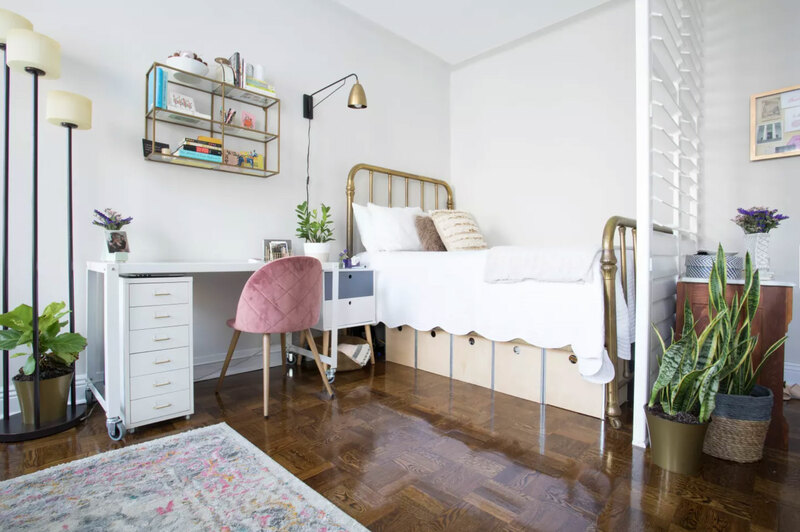 I came across this image on Kate Singer’s Instagram and I thought it was such a cool example of unconventional ideas for dividing a studio apartment! 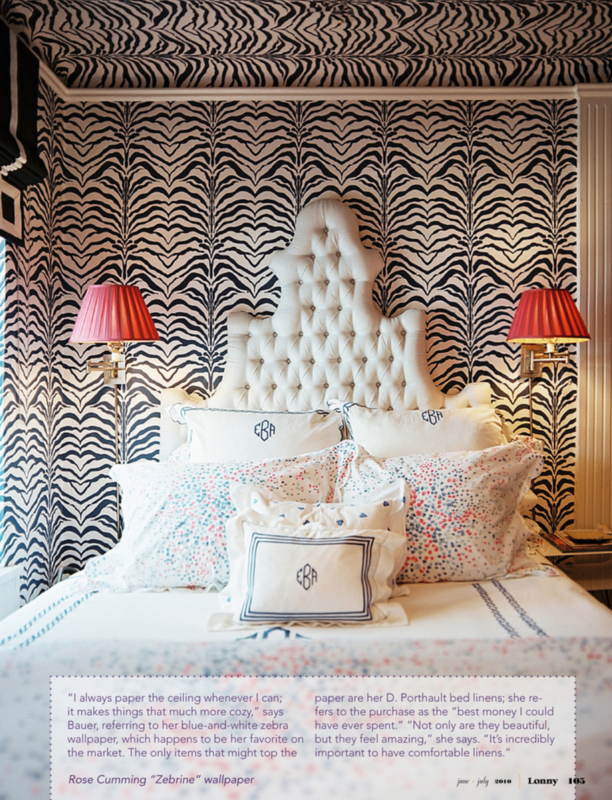 The four-poster bed obviously creates a subtle division – as I mentioned above, more a suggestion of division. I think it’s really great and if I were doing it over again in this apartment I might seriously consider a four-poster bed. It almost makes your bed feel like a cocoon while still being open, light and airy. I’ll be forever grateful to Darlene from Fieldstone Hill for suggesting this trick to me! Turning my desk out from the wall (in my old apartment), rather than flat against it, went a long way towards creating a feeling of division in my old apartment – especially with the big Ikea bookshelf directly opposite. Take note: this is a great thing to do in any space, not just studios! Turning furniture so that it sticks out from the wall really helps in creating a more dynamic and interesting floorplan. 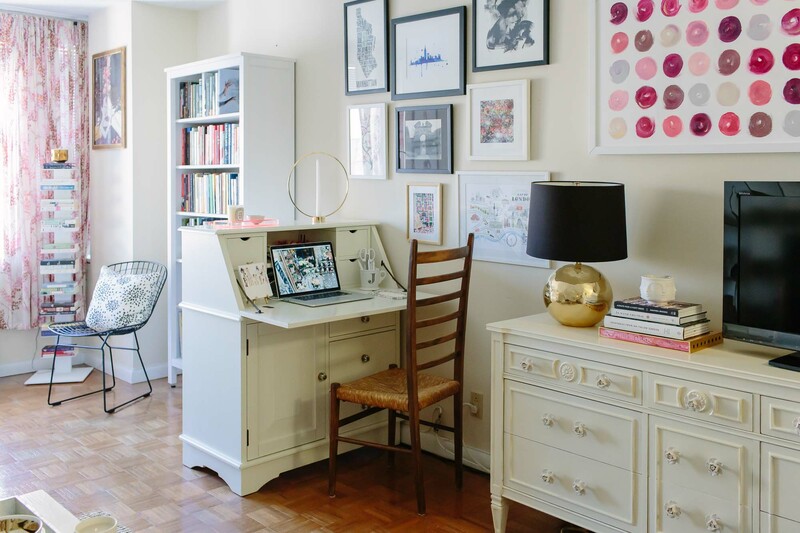 Try it with a piece of your furniture – it might not seem like it would work out but it’s something that designers do all the time, especially with desks – you can see a great example of it here. Having all of your furniture flat against the wall isn’t the best look…just by turning one piece, you can really make a big impact. 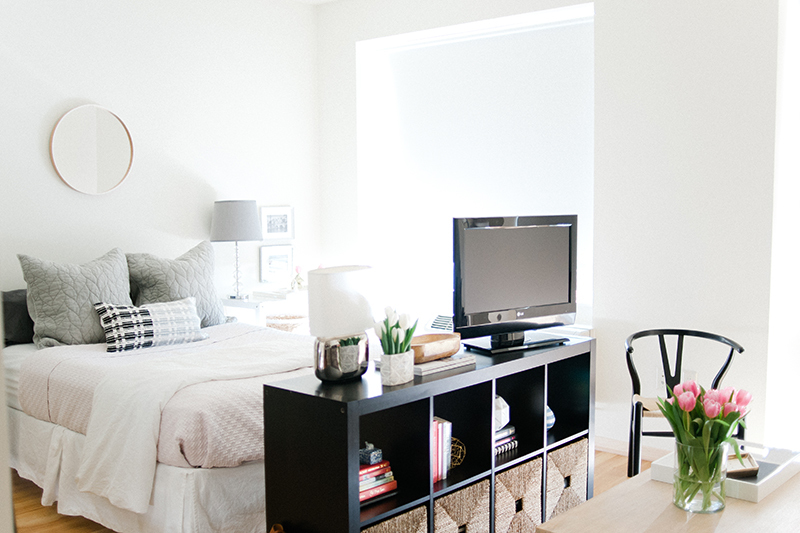 And again of course, these are great ideas for dividing a studio apartment! One more – if your studio is arranged in this type of floorplan where your bed sticks out into the middle of the room with the living area opposite (rather than the living area next to it, like my studio), putting a piece of furniture at the end of the bed and then placing some tall things on it (the TV or a pair of lamps), is a great way to “hide” the bed. 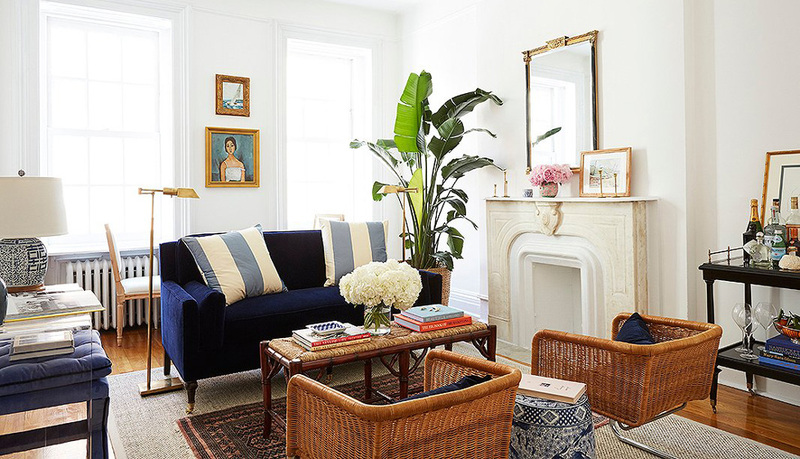 This is the home of Jackie Saffert featured on The Everygirl and I love how she put the TV there, with the sofa across from it – perfect arrangement! I love the Ikea bookshelf tactic! I have one and though I have roommates, I’m saving it for when I eventually get a place of my own to use as a divider!